Commentary on a Harmony of the Evangelists, John Calvin, 1558: Matthew 4:1-4, Mark 1:12-13, Luke 4:1-4, Matthew 4:5-11/Mark 1:13/Luke 4:5-13. Sermon for the First Sunday in Lent, Martin Luther, c. 1525. "Christ is tempted in all manner of ways, and still overcomes, that we also through his virtue may overcome." "...great privileges, and special tokens of Divine favour, will not secure any from being tempted." The Temptation of Christ (Matt 4:1-11): sermon by George Whitefield. "For we should do well to remember, that our blessed Lord in this great fight with, and conquest over the dragon, acted as a public person, as a federal head of his mystical body the church, even the common representative of all believers. We may therefore from this blessed passage gather strong consolations; since by our Lord's conquest over Satan, we are thereby assured of our own, and in the mean while can apply to him as a compassionate High Priest, who was in all things tempted as we are, that he might experimentally be enabled to succor us when we are tempted." "Coming to him - In a visible form; probably in a human shape, as one that desired to inquire farther into the evidences of his being the Messiah." "to be tempted--The Greek word (peirazein) means simply to try or make proof of; and when ascribed to God in His dealings with men, it means, and can mean no more than this." "Moses and Elijah each fasted for the same length of time. It was a period of spiritual exaltation, of meditation and prayer, of preparation for his work, and it is hardly probable that he felt the need of food." "The Costly Choice of Freedom," Andrew Prior, 2017. "Of Stones and Bread," Melissa Bane Sevier, Contemplative Viewfinder, 2017. "Jesus Put to the Test," Commented Bible Passages from Taize, 2007. Commentary, Matthew 4:1-11, David Lose, Preaching This Week, WorkingPreacher.org, 2011. "To be Christian is not to have that hole, that need, that awareness of finitude erased once and for all. Rather, to be human is to accept that we are, finally, created for relationship with God and with each other." Temptation of Jesus, audio telling, story in episodes, graphic, audio and written commentaries. Go Tell Communications, Biblical Storytelling for the Global Village, 2011. "Into Temptation," David Lose, Working Preacher, 2011. "...it's important to recognize that temptation is not once and done." "Busy Pastors, Holy Lent," Bruce Epperly, Patheos, 2011. "The Devil Debriefs," Alyce McKenzie, Edgy Exegesis, Patheos, 2011. "In the Gospels, the present time is viewed as a showdown between God's rule as inaugurated by Jesus, and that of Satan. That bigger picture is the context for this temptation scene in Matthew 4:1-11." God Abstracted, Kyle Childress, The Ekklesia Project, 2011. "I'm Sure Milton Keynes is a Beautiful Place," Neil Chappell, aweirdthing, 2011. "How will your life be defined?" Lectionary Blogging, Lent 1, John Petty, Progressive Involvement, 2011. "Matthew's point of view is precisely that the Lord is among us in Jesus." "'Desert Tower to Angel Flight. You are cleared to land,'" Lent 1A, Peter Woods, I Am Listening, 2011. "It is at the point of discipline and due diligence that Jesus renders himself most vulnerable." Holy Textures, Understanding the Bible in its own time and in ours, Matthew 4:1-11, David Ewart, 2011. "In this passage Jesus begins to demonstrate in words and deeds that he is indeed worthy of the high honour ascribed to him by angels and voices from Heaven - the Messiah, God's Son, the Beloved." "No Machismo," Debbie Blue, The Hardest Question, 2011. "The central figure of our faith at this central moment in his ministry refuses the will to power." Exegetical Notes by Brian P. Stoffregen at CrossMarks Christian Resources. "...'diakoneo' (from where we get "deacon") is a word that original referred to 'waiting on tables,' i.e., to serve food. Boring ("Matthew," NIB) notes the irony in this concluding verse: 'By placing the kingdom of God first, even though it meant rejecting food and the help of angels, Jesus finally receives both, thus becoming an anticipatory example of his own teaching (6:33). [p. 164]'"
Commentary, Matthew 4:1-11, Audrey West, Preaching This Week, WorkingPreacher.org, 2008. "The Temptation," Gospel Analysis, Sermons from Seattle, Pastor Edward F. Markquart, Grace Lutheran Church, Seattle, Washington. Detailed background and exegesis. "First Thoughts on Year A Gospel Passages in the Lectionary: Lent 1," William Loader, Murdoch University, Uniting Church in Australia. "Ultimately the focus is what it is in Matthew: doing the will of God alone and saying no to other gods. But doing the will of God needs unpacking: what is God?s will? What is God about? What then am I about?" Lectionary Commentary, Matthew 4:1-11, Cheryl Kirk-Duggan, The African-American Lectionary, 2009. "This text teaches us to celebrate the power of embodying the gift of being children of God, realizing a spiritual life that daily prepares us to recognize temptation and having the tools that will allow us to see and transcend them, before they morph into addictions." Dylan's Lectionary Blog, Lent 1, 2005. Biblical Scholar Sarah Dylan Breuer looks at readings for the coming Sunday in the lectionary of the Episcopal Church. "Jesus will not accept just any word from scripture as God's word to him at that moment. For Jesus, it's not just about God's truth; it's also about God's time, God's call, and most of all about God's love." "First Sunday in Lent: Matthew 4:1-11," New Sight, New Life: Lenten Gospels, Gracia Grindal, Word & World: Theology for Christian Ministry, Luther Northwestern Theological School, 1996. "Jesus Tempted," Rev. Bryan Findlayson, Lectionary Bible Studies and Sermons, Pumpkin Cottage Ministry Resources. Includes detailed textual notes. "The theology of the temptation story finds its source in the Exodus, in the wilderness testing of Israel. Jesus faces a similar test, but unlike Israel, does not fail. We too face the test, and in Christ we overcome." Lectionary Commentary and Preaching Paths (Lent A1), by Jirair Tashjian, at The Christian Resource Institute. "Will I walk with God whether or not I get that job, whether or not that cancer is healed, whether or not my loved one pulls through a life-threatening situation? Or, am I going to put God to a test and say, If you do this for me, then you're my God, but if not, I will have nothing to do with you. The Spirit-filled life which Jesus lived was a life that was unconditionally surrendered to God regardless of the outcome." "The Temptation," Larry Broding's Word-Sunday.Com: A Catholic Resource for This Sunday's Gospel. Adult Study, Children's Story, Family Activity, Support Materials. "What little delights in life tempt you? Are they hard to resist? Why?" "Let Go and Be Rich," Lent 1A, Fr. Gerry Pierse, C.Ss.R., from Sundays Into Silence: Reflections on the Sunday Gospels in the Light of Christian Meditation. Claretian Publications. "There is a great danger in prayer forms that give us power over others: the power to draw crowds, or to elicit tears, or confessions, or to speak in tongues or to heal." "Dealing With Temptation," by Greg Herrick at the Biblical Studies Foundation. "Notice that Jesus was led by the Spirit into the desert to fast for forty days and forty nights (probably recalling by way of parallelism Israel?s 40 years in the wilderness, where she grumbled at God because of the lack of food; see Deut 8:2) and that it was when Jesus was at his weakest that the Devil came to him to tempt him. It is a safe thing to assume that the Devil will attack us when we?re at our weakest and in the area that we?re most vulnerable. In this case, it was a temptation regarding hunger and food." "Transformed on the Mountain: Ritual Analysis and the Gospel of Matthew," by K.C. Hanson, St Olaf College. From Semeia 67 (1994). Allen, William Loyd, "Matthew 4:1-11 - The Devil at the Crossroads," Review & Expositor, 1992. Craddock, Fred B., "Testing that Never Ceases," The Christian Century, 1990. Farris, Patricia, "Bedrock Truths," The Christian Century, 2002. Garlington, Don B., "Jesus, the Unique Son of God: Tested and Faithful," Bibliotheca Sacra, 1994. Hanson, K.C., "Transformed on the Mountain: Ritual Analysis and the Gospel of Matthew," Semeia, 1994. Johnson, E. Elizabeth, "Temptation," Journal for Preachers, 2004. Jones, J. Estill, "The Temptation Narrative," Review & Expositor, 1956. Kelly, Balmer H., "An Exposition of Matthew 4:1-11," Interpretation, 1975. Kesich, Veselin, "Christ's Temptation in the Apocryphal Gospels and Acts," St Vladimir's Seminary Quarterly, 1961. Kesich, Veselin, "Hypostatic and Prosopic Union in the Exegesis of Christ's Temptation," St Vladimir's Seminary Quarterly, 1965. Koyama, Kosuke, "'Not by Bread Alone...' How Does Jesus Free and Unite Us?" Ecumenical Review, 1975. Lischer, Richard, "The Journey Begins," The Christian Century, 1999. Sahl, Joseph G., "The Impeccability of Jesus Christ," Bibliotheca Sacra, 1983. Saunders, Daniel J., S.J., "The Devil and the Divinity of Christ," Theological Studies, 1948. Schiavo, Luigi, "The Temptation of Jesus: The Eschatological Battle and the New Ethic of the First Followers of Jesus in Q," Journal for the Study of the New Testament, 2002. Sheeley, Steven, "The Exercise of Jesus' Royal Power: Lent through Trinity Sunday," Review & Expositor, 2007. Stegner, William Richard, "The Temptation Narrative: A Study in the Use of Scripture by Early Jewish Christians," Biblical Research, 1990. Streets, Frederick J., "Clarification," The Christian Century, 1993. Taylor, Arch. B., Jr., "Decision in the Desert: The Temptation of Jesus in the Light of Deuteronomy," Interpretation, 1960. Taylor, Barbara Brown, "Remaining Human," The Christian Century, 1996. Taylor, N.H., "The Temptation of Jesus on the Mountain: A Palestinian Christian Polemic against Agrippa I," Journal for the Study of the New Testament, 2001. Thompson, Philip E., "Between Text & Sermon, Matthew 4:1-11," Interpretation, 2006. Wainwright, Elaine, "Reading Matthew 3-4: Jesus--Sage, Seer, Sophia, Son of God," Journal for the Study of the New Testament, 2000. Williamson, Lamar, "Matthew 4:1-11, Expository Article," Interpretation, 1984. Wink, Walter, "Matthew 4:1-11, Expository Article," Interpretation, 1983. Wolf, Carl Umhau, "The Continuing Temptation of Christ in the Church: Searching and Preaching on Matthew 4:1-11," Interpretation, 1966. "Choose Life!" the Rt. Rev. J. Neil Alexander, Day 1, 2010. "A Friend of the Devil," The Very Rev. Samuel G. Candler, Day 1, 2008. "The Testing Grounds of Faith," - Lent 1 - 13 February 2005, Hubert Beck, Göttinger Predigten im Internet: Every Sunday Sermons based on the RCL by a team of Lutheran theologians/ pastors. Father Andrew M. Greeley, "Priest, Author, Sociologist," Commentary and Homily. "The Temptation of Jesus," Illustrating the Story (lessons, children's sermons), coloring pages, activity sheets, crafts, children's songs. MSSS Crafts. "Who Says?" Charles Kirkpatrick, Sermons4kids.com. "Jesus Says No to the Devil," Sunday School Lessons: Family Bible Study, art projects, music, stories, etc. "Jesus Is Tempted," children's study, puzzles, coloring sheet, etc. Higher Praise Christian Center. Gospel Puzzles for the Lectionary, Lent 1A, Mark Ryman, edoxy.com. "The Temptation of Christ," Pat Slater, sermons4kids.com. "Beneath the Desert Sun," from A Certain Jesus by Jose Ignacio and Maria Lopez Vigil. Ideal for catechetical and liturgical dramatization of today's gospel. Claretian Publications. "Wicked Ruler," John Cosper, Jr., dramatix. "The Easy Way Out," Michael English, Milton Parish Church Drama Resources. Clip Art, Matthew 4:3, Fr. Richard Lonsdale, Resources for Catholic Educators. Matthew 4:1-11, Lectionary Clipart, Hermanoleon Clipart. Clip Art Images: Matthew 4:1-11, Temptation of Jesus, Temptation of Jesus #2, Misioneros Del Sagrado Corazón en el Perú. 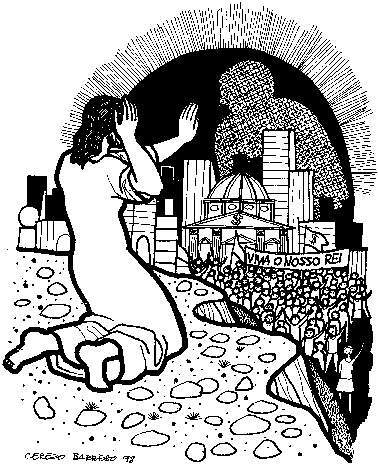 Matthew 4:1-11, at Cerezo Barredo's weekly gospel illustration. Liberation emphasis. Matthew 4:4, Heartlight - Free Christian PowerPoint Backgrounds. Clip Art: Satan Tempts Jesus, Julius Schnoor von Carolsfeld woodcuts, World Mission Collection, Wisconsin Evangelical Lutheran Synod. Hymns with Scripture Allusions: Matthew 4:1. The Cyber Hymnal. "Our Lord, You Were Sent," Carolyn Winfrey Gilletteis a new hymn about Jesus' temptations written to the tune of FOUNDATION 11.11.11.11 ("How Firm a Foundation"). "The Sun Beat Down Upon His Head," TEXT: Mark Ryman (2005) based on Matthew 4:1-11. TUNE: "Truro." New Hymns for the Lectionary.